In Search of the Highest Truth: Adventures in Yoga Philosophy is a clear and concise guide to seeing the modern world through the lens of yoga's ancient teachings. This book is a must read for teachers who want to integrate yoga philosophy into their classes and for anyone who wants to expand their knowledge of yoga’s ancient wisdom. 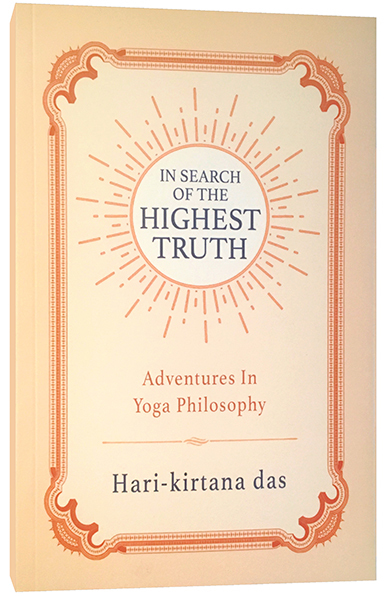 "A thought provoking and profound read"
"Distills ancient yogic wisdom into modern-day practically"
Illuminating and entertaining, 'In Search of the Highest Truth' helps readers unlock the secrets of yoga’s ancient wisdom. When guest lecturing at yoga teacher trainings, I'm often asked to recommend a book that provides an overview of yoga philosophy. This has been a conundrum for some time: although I have my favorite translations of Sanskrit scriptures, I felt my students needed a more accessible, practical book. It's my hope that In Search of the Highest Truth fills this need. Curious to know what's inside? Check out a sample chapter here. "Makes central ideas from the classic texts of yoga easy to grasp." — Jayadvaita Swami, author of “Vanity Karma: Ecclesiastes, the Bhagavad-gita, and the Meaning of Life"
"Eminently readable and engaging.... Fills a gaping hole in the popular literature on yoga." — Carol Horton, author of "Yoga, Ph.D.: Integrating the Life of the Mind and the Wisdom of the Body"
"An excellent introduction to yoga philosophy." — Joshua M. Greene, author of "Swami in a Strange Land: How Krishna Came to the West"
"Takes us beyond fluffy explanations of yoga to the deep and life changing potential that we are hungry for."